DPCI provides digital asset management consulting to ESPN for the implementation of ResourceSpace along with the development of custom XMP metadata panels for Adobe Bridge to capture ESPN’s custom metadata for assets. ESPN, Inc. is the leading provider of multimedia sports entertainment around the world. Founded in 1979, ESPN is the first network to broadcast sports programming around the clock in the United States. Today, ESPN has expanded to include 48 television networks around the world, broadcasts to 200 countries and delivers content to radio, print, web and mobile consumers. When ESPN’s Marketing department came to DPCI for help, the department was using a proprietary digital asset management (DAM) system, to store and manage corporate logos files. To distribute these logos, the department used a separate Web-based system. ESPN’s marketing staff members expressed frustration with the performance of the DAM system, the limited technical support from the vendor, and the software’s annual cost. 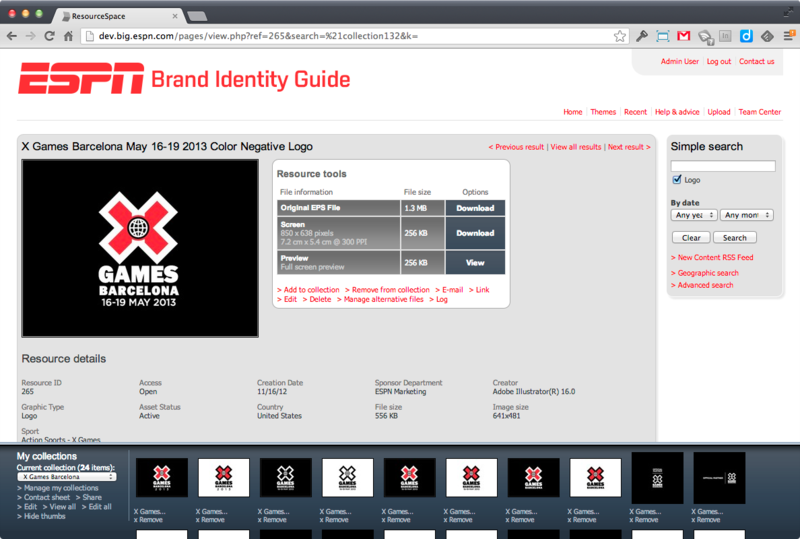 ESPN also wanted to revamp the metadata schema to better categorize logo files so that those files were easier to find. As the current DAM was not accessible across all departments, other divisions could not access necessary logos and instead had to request logo assets from marketing staff members. While ESPN Marketing continued to utilize the proprietary DAM, other departments, including the Photography department, began using ResourceSpace, an open-source DAM system distributed under a BSD-style license. ESPN retained DPCI to assist with the migration of digital assets to ResourceSpace and to create a standard, intuitive process for capturing specific metadata. DPCI provided digital asset management consulting services to design a solution that would meet the specific needs of ESPN’s Marketing team. DPCI started with an analysis of the existing DAM, and collaborated with ESPN Marketing staff to establish metadata requirements for ResourceSpace. DPCI next configured ResourceSpace and established a workflow and digital rights management process for use across all marketing divisions. 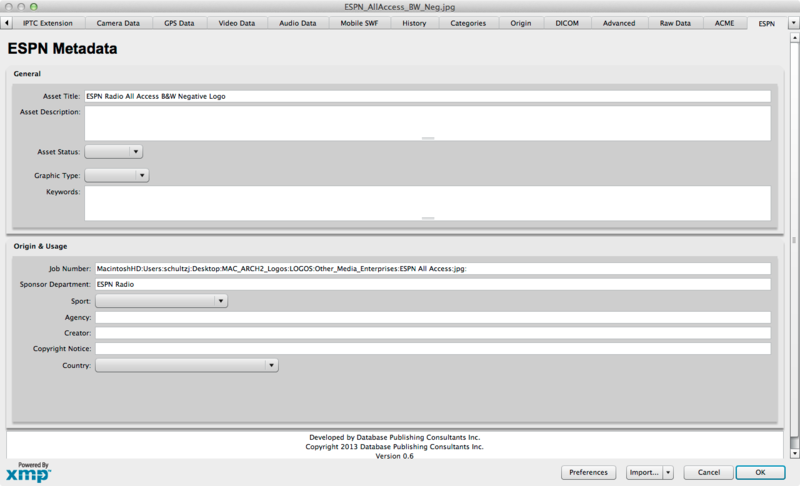 DPCI then created a custom XMP Metadata Panel and XMP Get Info Panel for Adobe Bridge to allow marketing staff to leverage Adobe Bridge’s metadata features to easily embed proper metadata into assets. When each digital asset is uploaded to ResourceSpace, the metadata is mapped to fields within the DAM. Then, when an asset is later exported from the DAM, ResourceSpace writes the metadata back into the asset file, allowing ESPN marketing staff to deliver assets to other users and systems with the metadata intact. DPCI also worked with ESPN to enhance the overall user experience of ResourceSpace. Through custom ResourceSpace plug-ins, DPCI extended the system’s functionality to meet ESPN’s requirements while maintaining the ability for ESPN to update the core ResourceSpace codebase easily. 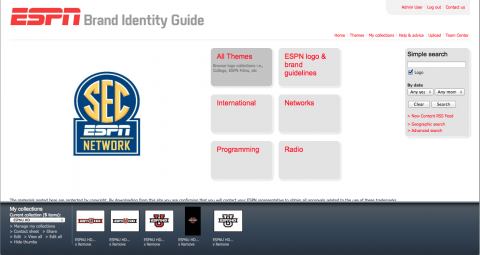 In addition to modifying the standard color scheme, layout, and navigation bar, DPCI further customized the home page to include buttons that represent each of ESPN's unique asset categories. 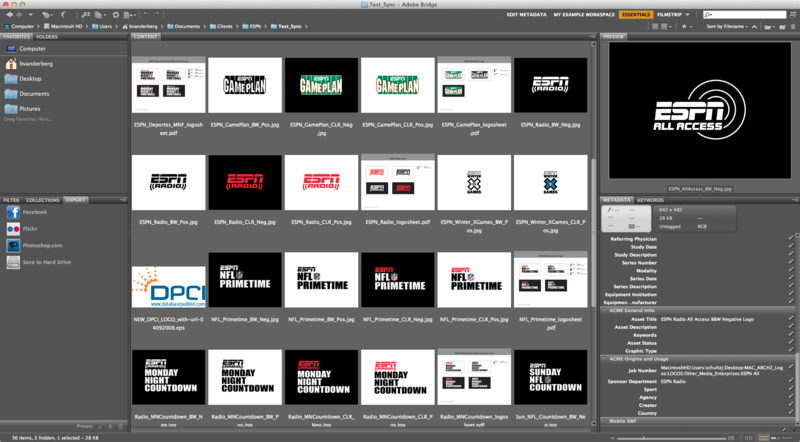 To prepare the new ResourceSpace digital asset management system for game time, DPCI also helped the ESPN Marketing team with the batch upload of 1000’s of logo assets, all tagged with metadata and then organized into the relevant collections and themes. With the help of DPCI, the ESPN Marketing staff now has an enhanced, open-source digital asset management solution that saves them time and money. ResourceSpace and the custom Adobe XMP panels helps to reduce the work effort of ESPN’s Marketing staff members who may now edit and extend metadata information through Adobe Bridge even while offline. Content editors now input custom metadata for marketing assets using the Adobe Bridge interface, and then upload the assets with metadata into ResourceSpace. The additional metadata now available in ResourceSpace provides a more accurate yet simple search and retrieval process while the use of XMP allows for better rights management and traceability of those digital assets when shared with external users and systems. The ESPN marketing department continues to work with DPCI to further extend the ResourceSpace implementation and plans to obtain additional workflow consulting from DPCI for the use of XMP in other divisions.